The accolades continue to pile up for Hidden Spring Winery of East Hodgdon. SPRINGFIELD, Massachusetts — The accolades continue to pile up for Hidden Spring Winery of East Hodgdon. For two consecutive years, Jean and Richard Sloat, owners of the Hidden Spring Winery, have earned awards from the “Big E” wine competition, which takes place in June. The Big E, “New England’s Great State Fair,” is held each autumn in Springfield, Massachusetts. The fair is the largest agricultural event on the Eastern Seaboard and attracts more than 1 million visitors each year. Contestants from across New England submit over 190 bottles of wine. Certified wine judges, including specialists and board members of the AWS (American Wine Society), judge each wine on its own merit. The first year, 2017, both bottles won a medal, according to Jean Sloat. 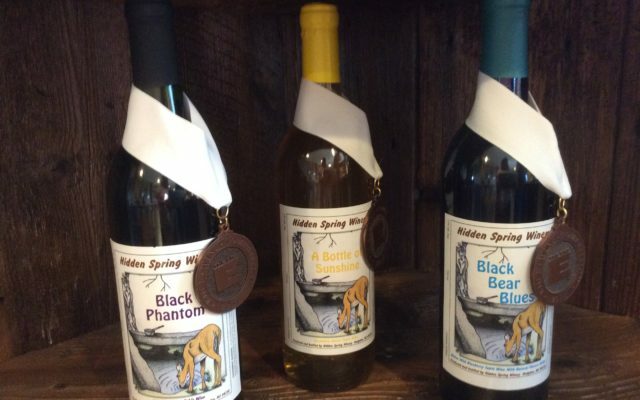 Their wine Bottle of Sunshine, which is the color of dandelion and has an aroma of honey, won a bronze, as did The Black Phantom, a dry wine made from Maine wild elderberries. This year, 2018, the business won another bronze medal for its wine Black Bear Blues, which is a semi-dry wine with flavor derived from Maine wild blueberries. The wines submitted are determined by a popular vote of customers at their winery, located on 1057 White Settlement Road. All medal winners are displayed in the Wine and Cheese Barn during The Big E, exposing New England wines to a potential audience of over 1.8 million fairgoers. This year, the Big E is Sept. 14-30. Jean and Richard Sloat opened Hidden Spring Winery in East Hodgdon back in November 2015. The Sloats, who are also owners of Jean’s Serendipity in downtown Houlton, started small, with a handful of seasonal wines sold from their tasting room. The shop also features a number of wine-related gift items for sale, as well as T-shirts. The couple have since expanded to offer small meals, often combined with entertainment, at their business. “We invite people to visit the Hidden Spring Winery to enjoy alluring fall scenery, and vote on your favorite wine you desire us to submit in 2019,” said Jean Sloat. Each visitor between now and Sept 13, may enter into a raffle drawing to win a pair of tickets to this year’s Big E fair, which includes free parking. The winner will be announced on Thursday, Sept. 13, on the couple’s Facebook page: www.facebook.com/Hidden-Spring-Winery.